Dr. Stack is board certified in diagnostic radiology. He received his bachelor’s degree from Yale University, his medical degree from Rutgers University and his MBA degree from Columbia University. Dr. Stack came to Westchester County in 1988 for his radiology residency at New York Medical College. He earned the position of chief resident, and has practiced in Westchester County almost continuously since that time. Since 1995, Dr. Stack has been a member of the Society of Breast Imaging, specializing in mammography, 3-D mammography, breast ultrasound, breast MRI and imaging-guided breast procedures. Dr. Stack is past president of the New York Breast Imaging Society, and has lectured nationally. 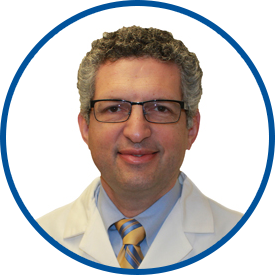 He currently serves on committees of two different national medical organizations, the American College of Radiology and the Society of Breast Imaging. Both task forces that Dr. Stack serves on are dedicated to providing the best possible experience for patients having radiology exams such as mammograms. He is author of the chapter “Stereotactic Breast Biopsy” in the 2010 medical textbook Kuerer’s Breast Surgical Oncology. Dr. Stack recognizes that waiting for mammogram results can cause anxiety and stress for patients. Therefore, he endeavors to meet with each patient immediately following her mammogram, to show her the mammogram images, discuss her results, and answer her questions. He was awarded Westmed’s 2016 Dr. Leonard Finkelstein Excellence Award. This is a respected award presented by the Westmed Board of Directors to one physician each year. The award is presented to a physician, nominated by physician colleagues and employees, who demonstrates the highest level of clinical quality along with compassion and selfless devotion to patient care.